As we all know, Macbook Pro generally runs efficiently. Its advanced processors helps you power through the most complicated technical computing tasks. Due to the amazing flash storage-based architecture, it makes what you do on it incredibly fast and responsive. Hence, a large number of people choose Macbook Pro in recent years. Especially the businessmen and college students, Macbook Pro become a symbol of fashion. Most of the businessmen use it in office meeting room. It runs fast and helps the businessmen save precious time. After all, time is money. Students would like to carry the Macbook Pro to attend the class so as to record the important points in time. However, most of people may find that it runs slowly after they use the device for a certain of time. Things change. This is normal. As time goes by, there will be more and more junk and useless files that occupy much memory. Does this thing happen to you? Is your Macbook Pro running slowly? Is there a way to speed it up? Let’s talk about it. 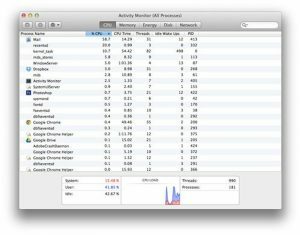 Why is Your Macbook Pro Running Slowly? Firstly, your Macbook pro runs slowly because there are too many programs to load during the startup. All those programs will run all the time in the background once you start the device. Too much running in the background will occupy huge memory. It will fail to works properly. Secondly, more and more software and files are stored on your hard drive. There are caches, Logs, Trash, Leftovers, junk files, and manages extensions, language packs, useless software after you use the device. As you use Safari or Google Chrome every day, There are more and more browsing history, pictures and videos caches, bookmarks, toolbars, extentions, plug-in and other components on your Mackbook Pro. Though every single of them is a mall one. Their total memory is hude. You can’t ignore them. If you don’t clean them up, they will pile up like a snow ball. Your hard drive will get full in the end. Thirdly, your OS X may be outdated. Apple releases new version of OS X and improve the performance regularly. Your older OS X surely runs slower. Fourthly, your Macbook Pro may be infected with adware or malware. 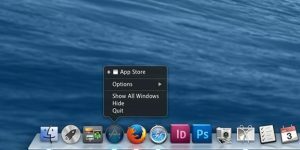 If you click on unsafe freeware, shareware or advertising-supported programs such as various browser add-ons or toolbars, your Macbook Pro can be infected. In this way, more malware can be downloaded to damage and slow down your device. Processing Macbook Pro speedup is supposed to have a certain level of computer literacy. 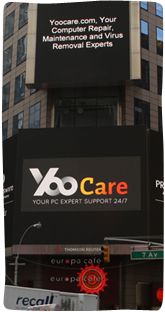 If you are not sure how to start and are afraid of making any critical mistakes damaging the computer system, please live chat with YooCare Expert now. Do you remember the feeling of a brand new Macbook Pro? Do you want that feeling back? Don’t worry. You don’t have to stand a slow Mac. You can make it faster. If your device is a Windows computer, view here. First of all, you need to speedup the startup. 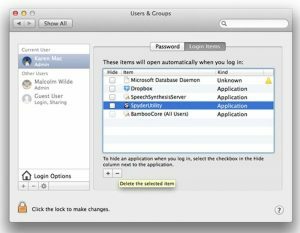 Some applications run and login automatically when you start the Macbook Pro. You can view the programs that are launched during the startup under Login items and delete them off the list. In the second place, you need to Clean up your hard drive. Remove all the caches, trash, leftovers, junk files on your computer. To make your Macbook Pro run faster, you must make sure there is enough free space on the hard drive. Usually, the free space should not be less than 10%. Empty the trash and your download folder that you don’t need any more. The widgets that you don’t use from the Dashboard also should be deleted. In the third place, update and use the newest version of OS X. 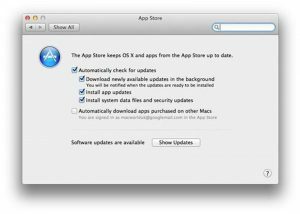 Perform a software update for your OS X. Once the software is updated, it will run faster. 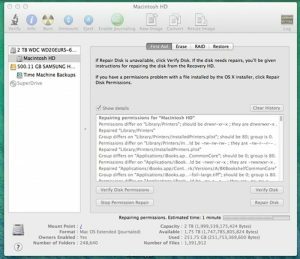 In the fourth place, change the Repairing Permissions to ensure that your files have the right permission on your Macbook Pro. It is possible to make your Macbook Pro run faster. Though it is not the newest one, you still can speedup it and improve your work effectively. Change the Settings and remove unneeded programs. You can get the speed and performance you like. Besides, you can check if there is malware or adware on your Macbook Pro frequently. If your Macbook runs extremely slow and always crashes down for no reason, it is probably infected. Detect and remove malicious software in time to get away from any threat. You also can upgrade your hardware to speedup the device. Of course, it will cost you some money. Don’t want to suffer from a slow Macbook Pro any more? Take action right now! Don’t know clearly where you should start and are afraid of making any critical mistakes damaging your computer? please contact YooCare Expert for further removal help.